Why are Slots Games Still So Popular? Rate this Article In the world of online gaming, the slots are still one of the most enduring. But how has this game survived the transition from a physical machine to a modern, screen-based form? In the world of online gaming, the slots are still one of the most enduring. But how has this game survived the transition from a physical machine to a modern, screen-based form? Looking at the history of these machines may hold the answer to why slots games are still so popular. First invented in 1895 by Bavarian-born mechanic Charles Fey in San Francisco, slots gaming has been popular ever since Fey developed his machine the “Liberty Bell.” It consisted of three spinning reels, each showing diamonds, spades, hearts and the cracked Liberty Bell. Lining up three symbols caused the machine to dispense coins, with a trio of Liberty Bells netting the highest win. The “Liberty Bell” was a big hit, with Fey renting the machines out to bars, and eventually, it became difficult for him to keep up with demand for manufacture. Fey’s machine dominated the market for several years until people began to develop their own slot machines. For example, Herbert Mills, a manufacturer of arcade machines in Chicago, came up with the “Operator Bell” and began producing them in 1907. Not long after, the popularity of the slot machines spread further, and eventually, the industry's center was moved to Chicago after San Francisco banned the machines in 1909. Mills was also the first person to feature fruits on the rotating reels instead of more traditional symbols, which is where the British term “fruit machine” originates. 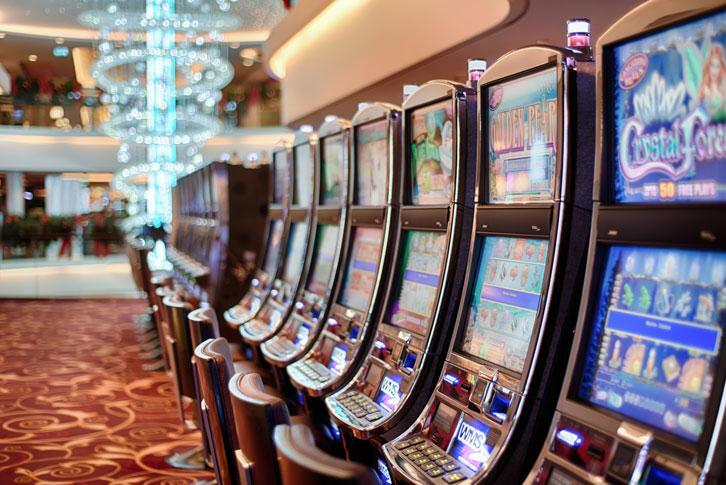 Another common name for slots machines is “the one-armed bandit,” referring to the single “arm” on the side of the machine, which is used to spin the reels inside. The use of symbols, such as fruits, card suits, stars, lucky numbers, and later, computer graphics, may be the key as to why the slots game still works so well in a different medium. While the first electronically-operated slot machines appeared in 1964, it wasn’t until 1976 when the first video slot machines arrived. Developed by Fortune Coin in Las Vegas, this was a big step forward in the development of the game as the game was displayed virtually on a screen. The popularity soared for this new incarnation. The mid-90s saw the introduction of the second screen bonus round, with the opportunity for an additional win from a different screen layout. This new feature again boosted the slot machine’s popularity and cemented its place as the number one arcade game. Soon after this development, traditional casino games began to appear online. Although there was some uncertainty about the effect that the internet would have on established arcade games such as the slot machine, this proved to be unfounded. The simplicity of the slot machine’s layout and mechanism translated incredibly well to a computer screen, and developers took the opportunity to expand the slots game. While Fey’s original layout can still be found online, the genre now includes games with five reels, different layouts, and many sets of symbols that are available across a range of platforms, from your computer screen to an app on your phone. There’s something out there for every gaming style!